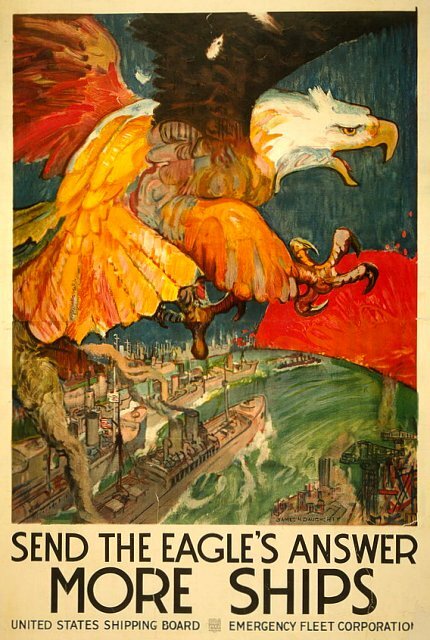 World War I required the greatest sea lift of American forces and equipment to that date. The "Bridge of Ships" would carry supplies and soldiers to Europe. A nation-wide effort was made in 1917-18 to put a merchant fleet at sea and to replenish the tonnage lost following German submarine sinkings in the North Atlantic. The Great War of 1914-1918 brought back an aspect of sea warfare that had not been seen on a large scale since the blockade of France in Napoleonic times. The destruction of enemy commerce, that largest and most important component of seapower, became a prime purpose of Germany in 1914, and to this end she developed the U-boat and the surface raider. This latter weapon is of particular interest in the history of ship design, for like commerce raiding itself, the surface raider was a full-fledged return to past principles. Many passenger liners were vessels of great endurance, whose speed compared favourably with that of contemporary warships. They could become armed merchant cruisers, to either protect or destroy trade. 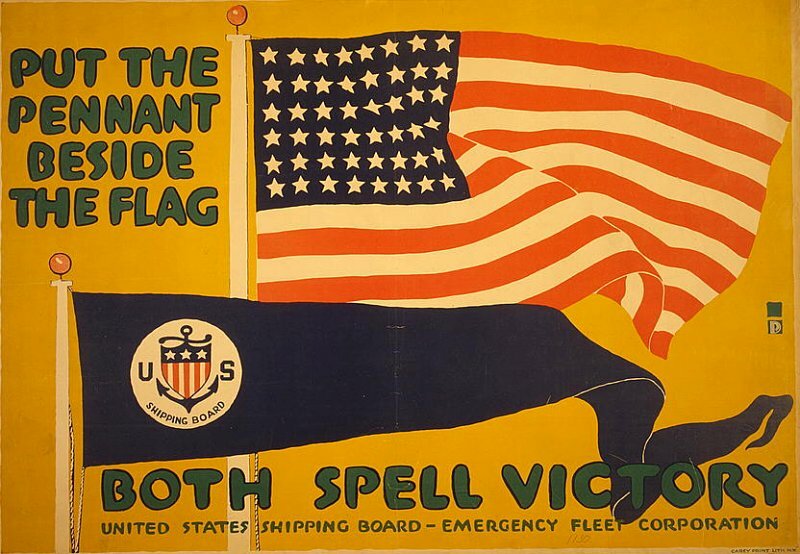 World War I showed conclusively that both types were valuable assets to seapower, on both sides. The Army Transport Service was designed to move relatively small numbers of soldiers under peacetime conditions, not to handle the requirements of this war. Consequently, the Navy Department assumed responsibility for most of the overseas troop transport. The Navy assembled a collection of American passenger liners, borrowed British ships, confiscated enemy vessels, and assorted other ships to carry about two million service men across the Atlantic. Because of the threat of German submarines, ships were armed and organized into convoys. The convoy system successfully protected all American shipping to France, although a few ships were sunk on the return voyage to the United States. At the end of the war, the Navy transported forces back to the United States using any available ships. The Spanish-American War provided a modicum of experience in transportation management that was invaluable during World War I. This conflict created greater demands on the nation's transportation systems than had been imagined previously. The nation mobilized more than four million men for the Army, more than half a million for the Navy, and more than 78,000 for the Marine Corps; it shipped about two million of them overseas. Yet the overseas movement of units was only a small part of the transportation problems. Before a serviceman sailed to France, he was transported from his home to a training camp, sometimes to a second camp, and then to the port of embarkation. With soldiers, came requirements for moving unit equipment, including horses and mules. The services also moved supplies, including food and ammunition, to the port and on to France. Cargo within the United States, such as raw materials to defense contractors or building materials to the sites of new cantonments, also taxed the transportation system. Supplies for French and British allies also required transportation, either as raw materials to factories, or as finished products to the Atlantic ports. In addition to these new military requirements, the nation's transportation system needed to accommodate essential civilian needs. 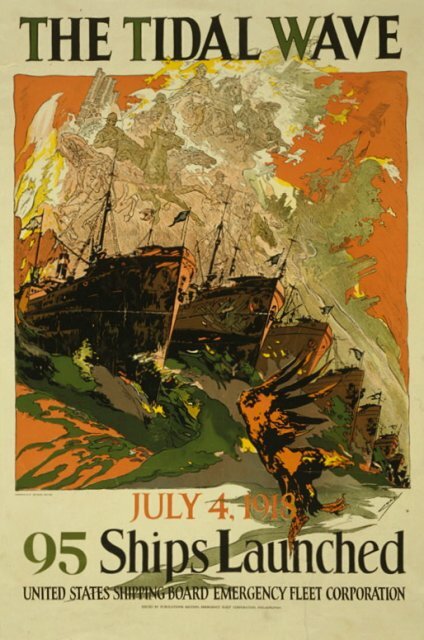 The Embarkation Service (ES) was established in the War Department by General Order 102, War Department, August 4, 1917, with responsibility for transporting American Expeditionary Forces (AEF) troops and supplies to Europe. Assigned to newly established Storage and Traffic Service (S&TS), War Department, by General Order 167, War Department, December 28, 1917. Division of Inland Transportation (DIT), responsible for supervising transportation of AEF troops and supplies from U.S. interior to embarkation points, established in S&TS, by a letter of Maj. Gen. George W. Goethals, S&TS Director, appointing Harry M. Adams, Vice President in Charge of Traffic of the Missouri Pacific Railroad, as Director of Inland Transportation, January 10, 1918. S&TS redesignated Storage and Traffic Division (S&TD) and made a component of WDGS, by General Order 14, War Department, February 9, 1918; consolidated with Purchase and Supply Division, WDGS, by General Order 36, War Department, April 16, 1918, to form PS&TD. DIT redesignated Inland Traffic Service (ITS), PS&TD, April 22, 1918. ES acquired Water Transport Branch of TD, OQMG, May 25, 1918. ITS acquired Land Transport Branch of TD, OQMG, June 8, 1918. ES and ITS consolidated to form Transportation Service (TS) in PS&TD by Supply Circular 21, PS&TD, March 11, 1919. TS removed from PS&TD and made a separate War Department unit by General Order 54, War Department, April 21, 1919. Transferred to OQMG by General Order 42 (1920). The rail system soon became overloaded. As late as December 1916, four months before the United States declared war, shipments to France and Britain congested the port of New York. The U.S. entry into the war only increased transportation gridlock. Railroad officials tried using a committee to establish procedures and priorities for shipments, within the limits of anti-trust laws. Yet their efforts were insufficient. By December 1917, ships were unable to sail from New York because railroad congestion prevented deliveries of cargo and coal. Transportation problems compounded themselves, as rail cars were side-tracked as far as Pittsburgh and Buffalo. The government tried to alleviate the problem by using a priority system, where the originating agency would "tag" important items for express shipment. The agreement included bureaus from both the War and Navy departments, plus other government agencies. Shortly after the system was instituted, the government discovered that wartime priority systems were likely to be abused. Virtually all government shipments were tagged express, and determination of which shipments truly deserved priority handling was impossible. At the close of 1917, the government assumed control of the nation's railroads. This step allowed greater coordination between the lines than what was possible under existing anti-trust laws. Equally important, government control allowed a centrally managed priority system. The War Department issued orders that Army consignments could not be shipped to an Atlantic port without a War Department Transportation Order, which could only be obtained from Washington based on the ability of the port to receive the shipment. To coordinate priorities among different agencies, the government created a Director General of Railroads, who coordinated priorities among the War and Navy Departments. The Food Administration, Fuel Administration, Shipping Board, and War Industries Board were created at the same time. Government direction successfully reduced the level of congestion at ports, even as the number of shipments increased. There were few shipyards in the United States when the country entered the war, but they were built in record time. By early 1918 what was really lacking was men. To supply the enormous demand for ships it can easily be seen that the services of thousands upon thousands of work-men were required in the shipyards. To fulfill the demands of the country, or even of the world, to supply ships the US had to build six million tons of shipping in 1918, of which five mi1lion were steam vessels [the rest were un-powered barges]. The government made excellent progress, for by early 1918 contracts had been let for over seven hundred steel ships and five hundred Wooden and composite ships. A concrete ship was launched from a yard in the last part of 1917. In the whole year of 1914 there was produced in the United States 200,000 tons of shipping, while in 1917 the output was twenty-five times as much. In April of 1918 the same amount of shipping was built as in the whole year of 1914. This increase was mot nearly sufficient to meet the demands of tale army in France, for to do this yards must build at least fourteen ships each week. The English placed great faith in their standardized ships, but even with this apparent advantage in speed, the so-called American "fabricated" ships were built in a shorter time than the British ones. On the Atlantic coast the ships were launched stern foremost, vhereas on the Pacific coast this operation was carried on side-ways. For generations it had been the practice to build ships, from the keel up, in the yard. Every piece of wood or steel that went into the construction was shaped in the yard, and the shapes were extraordinarily complex. Instead of building ships we wanted to manufacture them, as automobiles, watches and locomotives are manufactured, according to one pattern. This would make it possible to roll, bend and punch shapes and frames in steel mills far inland, then to transport them to the coast, and there to rivet them together into finished hulls. Many structural steel and ridge shops were idle because their supply of steel had been cut off, and structural steel construction had greatly decreased. If ships could be built of fabricated steel these idle plants could be utilized in fashioning parts which could be sent to yards for erection into completed hulls. The fabrication principle had been successfully carried out in building bridges and office buildings, but when it came to applying it in ship construction difficulty was presented by peculiarly curved ship members. Had it not been for the interest displayed by Mr. James A. Farrell and the officials of the American Bridge Company, it would have found it harder than it was to fabricate and assemble ships. After several months of research and discussion the American Bridge Company decided to fabricate materials for two ships, but it would undertake to produce only the absolutely parallel portions of the midship body. About 60 per cent. of the total weight of our first two fabricated steel ships were thus manufactured. This was increased to 70 per cent. on the ships that followed. Finally bridge shops took contracts for 85 per cent. of the hull steel and even fabricated some of the difficult curved portions of the ship. A 100 per cent. fabrication job was possible but not practical because of the lack of bridge equipment. For example, there never were enough furnaces to bend frames and to bevel the angles. Theodore Ferris justly earned for himself an enviable reputation as a naval architect, and to him must be given much of the credit for laying down the plans for the type of fabricated steel ship as well as for the type of wood ship that was adopted. Ferris produced the design of the fabricated ship which the Fleet Corporation built. Here was a design with practically rectangular midship cross-section, a deck that was flat, a bottom that was flat, a ship with sides so straight that there was scarcely any sheer, and a stern that was square. Straight lines and flat surfaces were called for wherever it was practicable to apply them. Old ship-builders, accustomed to the odd traditional shapes of which vessels were built, simply gasped. Ferris' personal reputation as a great naval architect had much to do with the acceptance of the fabricated design. At all events, without his aid, yards in which fabricated ships were built hardly could have taken shapes rolled and punched in steel mills hundreds of miles away and assembled them into vessels which had not been surpassed in sea-worthiness and general utility. In the steel ships the most important and delicate part of the workd is the riveting, for the joints must be water tight and able to resist the full pressure of the sea water in the severest of storms. Estimating each ten thousand ton ship to require at nearly half a million rivets, then fourteen ships per week would require six and a half million rivets to be driven every sevmen davs. At first it may seem as tbough this great number of rivets would tax the resources of the country, but the real problem was men to drive the rivets. Riveting, is by nature a slow process, but if a quicker method could have been found for connecting the steel plates satisfactorily, it might have shorten the wvar by at least two years. To show the progress, made in the shipyards themselves, Hog Island was an excellent example. The place which was formerly but a mud flat now had a capacity of fifty ships at one time. Another yard was situated on a spot which had four feet of water over it a year earlier. 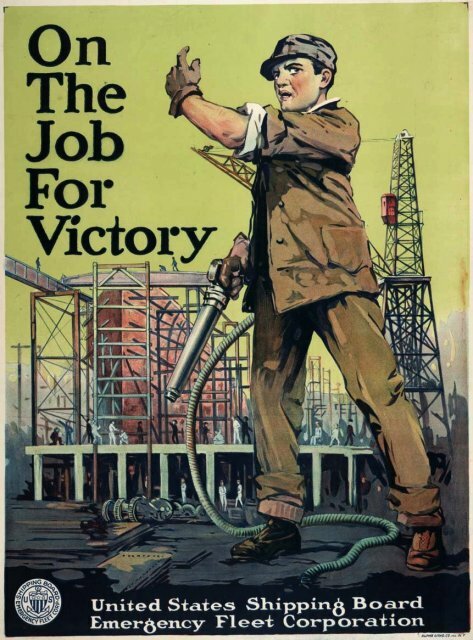 The requirement for men in the shipyards was the greatest problem with which the government had to compete. Hog Island alone required thirty thousand men of the various trades. Probably the most difficu1t, yet most attractive because of its paying qualities, was the riveting work. Authentic reports from the shipyards showed that one riveter earned one hundred and sevtenty-five dollars for one week's wrork. The average pay ranged from forty to one hundred dollars a week for the head of the riveting gangs and thirty-one cents and up for the assistants and apprentices. The success of watertight bulkheads in preventing a total destruction of the ships showed the necessity for good accurate work by the riveters, thousands of dollars depending upon the sucess of their operations. By saving a single rivet in the plate of a single ship similar rivets for similar plates were saved in dozens of identical ships assembled in the same yard. A plate so shaped that it was necessary to trim an angle meant a corresponding saving of labor in scores of similar plates. Thus, literally thousands of operations became unnecessary. The saving in labor and material was incalculable. That system could be applied only in yards devoted to the assembling of dozens of ships exactly alike in every respect. The principle of assembling a mechanism from interchangeable parts, a principle which had given us cheap good watches, locomotives and automobiles, was applied with brilliant success to the construction of ships. By far the largest of the yards in which fabricated ships were assembled was that built at Hog Island by the American International Shipbuilding Corporation. The cost of constructing the Hog Island plant, with its piers and shops, was approximately $65,000,000 (contract price). The yard covered 846 acres and comprised 250 buildings. It had 80 miles of railroad track; 3,000,000 feet of underground wiring; a hospital; YMCA, hotel, cafeteria, trade school, 12 service restaurants and 5 mess halls. Twenty locomotives, 465 freight cars and 165 motor trucks hauled material within the yard. 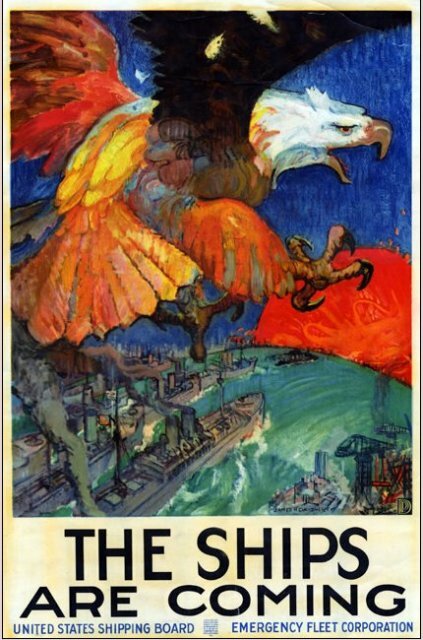 The United States Shipping Board Emergency Fleet Corporation was responsible for the construction of the Hog Island Ship Yard and its operation, through the American International Shipbuilding Corporation, during World War I. 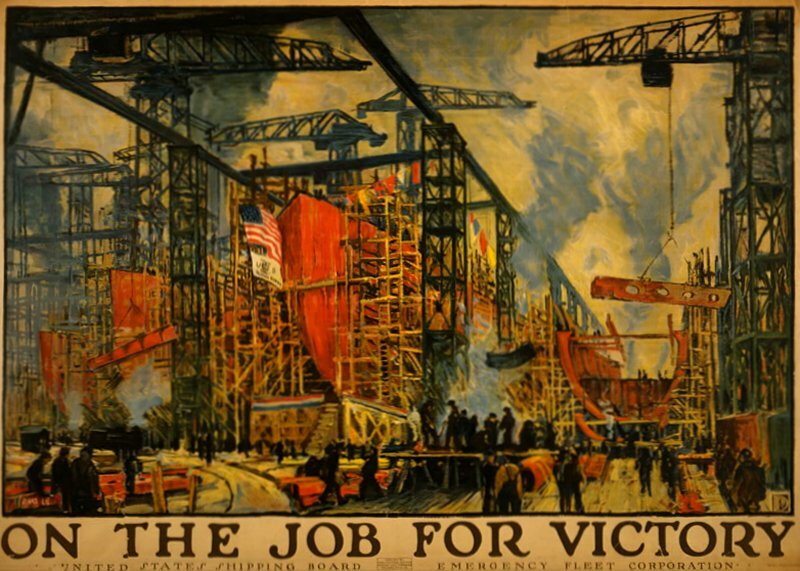 During the heyday of shipbuilding, around World War I, Philadelphia shipyards set records for physical plant and production. American International Shipbuilding Corporation at Hog Island was the largest shipyard in the world at that time, completing some 122 military vessels for the war effort. Two basic designs were to be fabricated at the yard, both to be collectively known as "Hog Islanders". Hog Island Standard Fabricated Type A freighter was Emergency Fleet Corporation Design 1022. Hog Island Standard Fabricated Type B passenger ship was Emergency Fleet Corporation Design 1024. The Type A design was a cargo carrier and the Type B was designed to transport troops. Both were simple designs geared toward mass production and aesthetic considerations were ignored. The hulls had no sheer and were syrnmetrical from the sides, resulting in some of the uglier ships to sail the seas. There was great enthusiasm in the yard when the first ship was ready to be launched. First Lady Edith Wilson had selected the Indian name Quistconck for the first of the Hog Island ships. "Quistconck " is the name by which Hog Island was known among the Delaware Indians and from which the present name was derived. In the language of the Delawares " quis-quis " meant " hog " and "unk" or "onk" meant a "place for," hence the word "quistconck" meant "hogs' place," the name which the Indians gave to the swampy or marshy island. On August 8, 1918, the first vessel was launched. Among the 100,000 people attending the christening of the freighter Quistconck were President Woodrow Wilson and his wife. Unfortunately, the Quistconck was not made completely seaworthy until after the war ended on November 11, 1918. 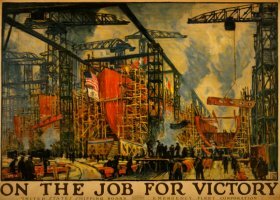 In an ironic twist, none of the 122 ships built at the shipyard was actually used in the First World War, though many helped to bring American troops back home. 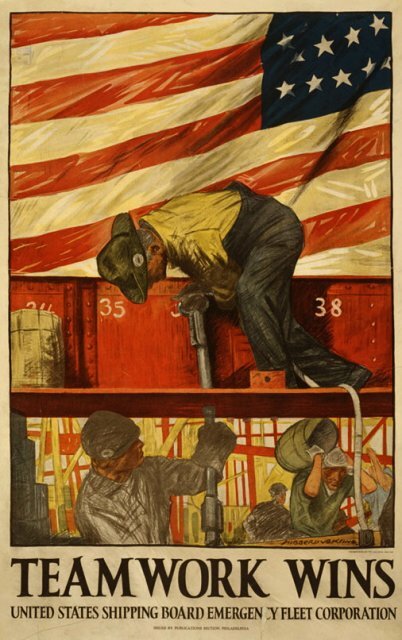 The original program provided for the construction of 110 cargo carriers and 70 troop transports, totalling 1,385,000 deadweight tons; but 58 of the troop transports were cancelled, on account of the armistice, leaving an active program of 110 cargo vessels and 12 troop transports. The last ship of the 110 was completed on January 21, 1921, and construction work then was suspended. Hog Island laid its last keel on December 8, 1919. At the height of its production a keel was laid on an average of every five and one-half days. During the fiscal year 1920-1921, 31 ships of 238,500 deadweight tons were completed, including 11 troop transports of 8800 deadweight tons, delivered to the Army and one ship of 8000 deadweight tons to, the Navy for conversion into an aircraft tender. By the end of June, 1918, the Fleet Corporation had nearly fulfilled its first promise to the War Department. Excellent as this performance was, it was never able thereafter to keep up with the constantly enlarging army demands. On 11 July 1918, General March ordered the Chief of Army Transportation Service to make a careful survey of tonnage then available and under construction, as it affected American military operations abroad from July 1, 1918, to July 31, 1919. Three programs were considered: A sixty-division program, giving a total strength of the American Expeditionary Force by July 31, 1919, of 2,500,000; An eighty-division program, giving a total strength of the American Expeditionary Force by July 31,1919, of 3,355,000; A one hundred-division program, giving a total strength of the American Expeditionary Force by July 31, 1919, of 4,260,000. The Army adopted the eighty-division program. Hog Island, with fifty ways for 7500-ton vessels; Submarine Boat Corporation, at Newark Bay, with twenty-eight ways for 5000-ton ships; The Bristol yard, with twelve ways for 9000-ton ships; the Federal Yards, with twelve ways for 9600-ton cargo-carriers, and the Southwestern Shipbuilding Company, with six ways for 8800-ton ships, all would have been producing at full capacity in 1919. When the armistice came all these yards had keels on their ways; and their organizations were complete and acquiring skill. 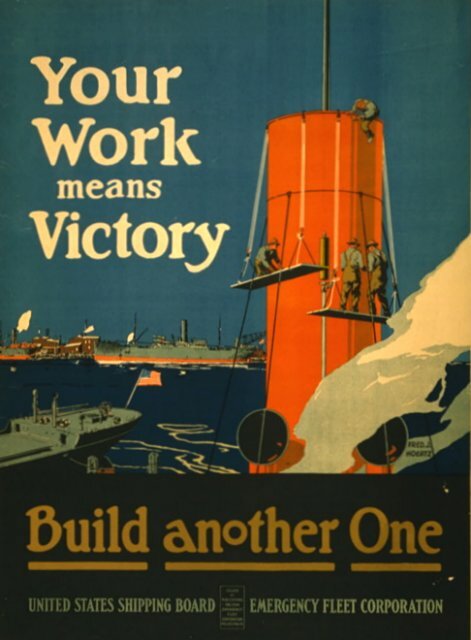 The signing of the armistice on November 11, 1918, left the great cargo program of the Fleet Corporation uncompleted. To give an idea of the demand for ships it may well be said that to supply the American army in France in 1918 it would require seventy ships to be loading all the time at American ports, seventy to be un-loading at European ports, and four-hundred and twenty to be crossing the Atlantic each way, continually. Allowing a loss by disaster of six ships per week, it would require in the vicinity of thirteen hundred ships to be continually in operation to feed, clothe and supply the American army in France. Somewhat more than 2,000,000 men were in France when the armistice was signed in November 1918. The maintenance of an army of two and one-half million men, on the basis of thirty pounds per man per day, with a turn-around of cargo-ships of seventy-five days, would have required about 5,000,000 deadweight tons of shipping. There was always a cargo-tonnage deficit after July, 1918, a deficit largely accounted for by General Pershing's requirement of 250,000 tons a month of construction material. The startling conclusion may be drawn that the longer the war lasted and the more the one-hundred-division program became necessary, the more impossible it would have been to supply cargo tonnage to feed the constantly increasing army abroad and to supply it with the munitions of war.